Hello everyone! Jerm here to let you know about a great Tampa Bay dining event for a great cause coming up soon! Two cooking classes will be held for non-golfers during The Melting Pot Golf Classic on Nov. 14 at Emerald Greens Golf Resort & Country Club, located at 13903 Clubhouse Drive in Tampa, to benefit St. Jude Children’s Research Hospital. 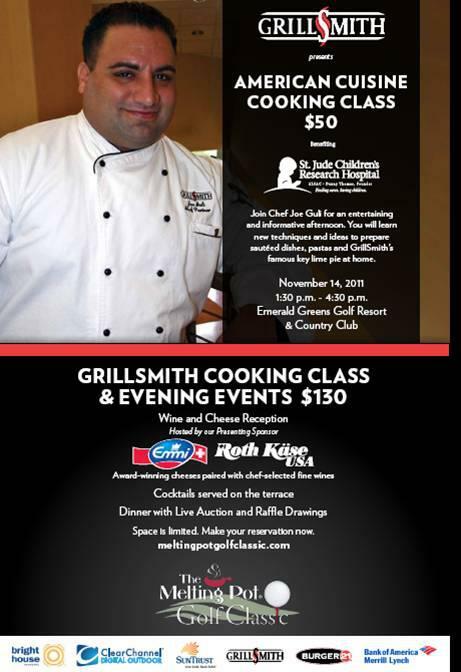 Front Burner Brands Corporate Chef Shane Schaibly and GrillSmith Corporate Chef Joe Guli will hold cooking classes for non-golfers from 1:30 – 4:30 p.m. at Emerald Greens Clubhouse. Chef Shane Schaibly will host a fondue cooking class and GrillSmith corporate chef Joe Guli will host an American cuisine cooking class where he will share new techniques and ideas to prepare sautéed dishes and will teach attendees how to make GrillSmith’s famous key lime pie at home. Chef Joe Guli recently won the Overall Best Chef Award at the Centre Club&apos;s 5th Annual Dueling Chef’s Competition benefiting the Children’s Cancer Center. Register for a class at meltingpotgolfclassic.com. The cost to attend one of the classes is $50! Don&apos;t miss out on this one folks as these are world class chef&apos;s and it will be a great event for sure! That&apos;s all for now, but stay tuned in for more things to do in Tampa Bay!